North Korean Foreign Minister Ri Yong-ho walks to speak to the media outside the Millennium hotel New York, U.S., September 25, 2017. SEOUL - The man who called Donald Trump “President Evil” last week at the U.N. General Assembly is actually a genteel intellectual who studies the memoirs of former U.S. presidents and has taste for fine whiskey, according to ten people who know him. 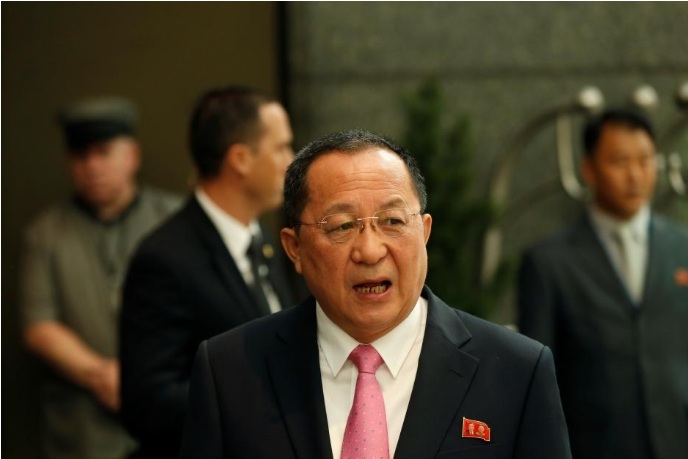 North Korea’s Foreign Minister Ri Yong Ho made headlines in the Sept. 23 speech to the 193-member General Assembly, saying North Korea’s next move might be to detonate a hydrogen bomb above the Pacific Ocean, in response to U.S. President Trump’s threat to “totally destroy” his country of 26 million people. While bellicose rhetoric often spouts from militaristic North Korea, it did seem out of character coming from what friends and colleagues described as a polite and softly-spoken career diplomat with a self-deprecating sense of humor and sharp debating skills. “As a negotiation partner, Ri was a good one, whose status seemed quite secure and who had relatively greater leeway to exercise during the talks,” said Wi Sung-lac, South Korea’s former envoy at the now suspended six-party talks aimed at dismantling Pyongyang’s nuclear program. “He was flexible and fundamentally rational,” said Wi, who met with Ri twice in 2011 in an effort to re-start the talks hosted by China, after they collapsed in 2008. Ri has a reputation for translating North Korean propaganda into measured diplomatic language when interacting with Western diplomats, and has studied the works of former U.S. presidents in his spare time. “He’s not just (North Korean leader) Kim Jong Un’s mouthpiece,” said one source who knows Ri personally. “He likes to read the memoirs of former U.S. presidents like Nixon and Bush. He also reads Kissinger. He tries to understand American thinking,” the source, who requested anonymity, told Reuters. The North Korean government does not provide foreign media with a contact point in Pyongyang for comment by email, fax or phone. Ri declined Reuters request for an interview while he was in New York for the annual gathering of world leaders at the United Nations. Born in 1956, Ri is the son of Ri Myong Je, former deputy director of the Organisation and Guidance Department (OGD), a shadowy body within the ruling Workers’ Party that oversees the appointment of key management positions within the state, according to South Korea’s unification ministry. His father was also an editor at the Korean Central News Agency (KCNA), the state media body that publishes Pyongyang’s bombastic propaganda statements. A fluent English speaker who studied at Pyongyang’s prestigious University of Foreign Languages, Ri has for years held a number of high-level posts dealing with the West. From 2003 to 2007, he was North Korea’s ambassador in London, where he lived with his wife and daughter while his son stayed at home in Pyongyang. A keen debater, Ri spent time engaging with British intellectuals during his time in London. At the private members Reform Club on London’s glitzy Pall Mall street, he charmed British academics over wine and lunch. “He clearly had a good sense of humor and was never belligerent or combative when it came to articulating his government’s perspective,” said John Nilsson-Wright, a professor at the University of Cambridge and senior fellow at the Chatham House international affairs think tank. Journalists caught a sample of that humor in Ri’s most recent off-the-cuff marks, when they asked the foreign minister in New York what he thought of the nickname “Rocket Man” that Trump’s has dubbed the North’s leader. “I feel sorry for his aides,” Ri quipped. Evans Revere, a former senior diplomat who dealt with North Korea under President George W. Bush and met Ri on a few occasions, recalled that he exuded self-confidence and was at ease in any setting, likely reflecting his pedigree as the offspring of one of Pyongyang’s elite families. While affable and approachable, Ri could be also “tough as nails”, and in meetings with Americans, he leaves no doubt that North Korea is determined to remain a nuclear-weapons state, Revere said. But the gregarious diplomat with an impressive rolodex of contacts has also faced increasing isolation, with the international community seeking to punish North Korea for its rapidly advancing missile and nuclear weapons programs. He was spotted dining alone at a gala dinner during a gathering of foreign ministers at the annual Association of Southeast Asian Nations (ASEAN) security forum in Laos in July 2016, while other ministers greeted one another and clinked wine glasses. The delegate of one participating Western country switched seats to avoid sitting next to Ri, saying he “can’t be seen in photos having dinner side by side with him,” a South Korean diplomat said, declining to identify the nation. This year’s ASEAN forum in Manila in August came after the U.N. Security Council imposed fresh sanctions on North Korea for conducting two intercontinental ballistic missile tests in July. Ri was often observed silent and stone-faced, as he held meetings with only four of the 27 foreign ministers attending the forum. Not talking to Ri at the U.N. General Assembly was a “missed opportunity” for Washington, given his close ties to the Kim family, said Joel Wit, director of the 38 North website and a former State Department official who first met Ri more than 20 years ago. Following a rare ruling Workers Party congress in May 2016, Ri was appointed foreign minister and given a position in the party’s powerful State Affairs Commission, a central decision-making body headed by Kim Jong Un. It was the first time a career diplomat had been promoted to the politburo since 1998, said Cheong Seong-chang, a research fellow at the Sejong Institute south of Seoul. In 2011, South Korea’s former nuclear negotiator Wi met Ri in Beijing and took the North Korean delegation out to a Chinese dinner. Hearing that Ri had grown fond of whisky during his time in London, Wi’s staff brought some Scotch for him -- which was then leaked to the press. “So he came in and said ‘Why do you have to tell every detail of our event to the media? ',” said Wi, who told Ri “not to pay attention” and have “just one drink” with him. The man who called Donald Trump “President Evil” last week at the U.N. General Assembly is actually a genteel intellectual who studies the memoirs of former U.S. presidents and has taste for fine whiskey, according to ten people who know him.